Descend 4000 years into a rarely opened flint mine. Make your own flint axe head, and share in a juicy venison spit roast accompanied by a hearty vegetable stew lunch. Only opened a few times a year to preserve its rich quality of being untouched, the Cannon Greenwells pit will be opened specially for you during this tour. 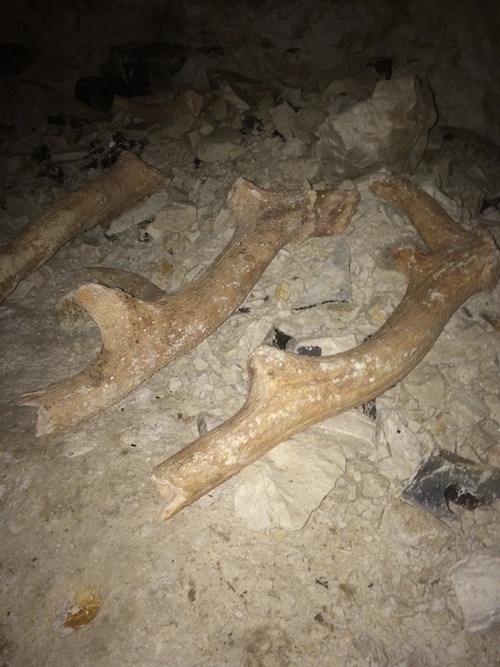 4000 year old antlers still laying where they were left by the miners. – A spark of experience that will get you started on your journey to become an experienced flint knapper if that is what you would like to do. 9:00am Introductions; Where we all meet up for a brew or coffee and get to know one another. 9:30am Watch how the axes were made with a demonstration of Flint Knapping covering the main skills needed to produce flint tools. 10:00am Gear up; A brief trip to the museum to get fitted up with hats and harnesses, followed by the spectacular decent into the Cannon Greenwells Pit, a truly unspoiled experience that takes you back 4000 years in time. 12:30am The Feast; Go back in time and gorge yourself on a delicious Venison spitroast and some home made chunky vegetable stew!! 1:30pm The art of Flint Knapping demonstrated again to give you the chance to recall the techniques and skills of this ancient craft. Prehistoric Survival Days out for Children. Course takes place on Grimes Graves, 4000 year old Neolithic Flint Mines in Norfolk. Stone Age experience for children aged 7-16 years. Will Lord will show you how to survive using the materials in the habitat, just as our ancestors did during the Stone Age, at a time when every day was a survival situation. The day starts at 9.30am and ends at 3.30pm. • Making basic tools from flint & bone. • Cordage - making cordage from natural materials that will help you to trap and bind your prey and every day needs. • Prehistoric cooking - where you can prepare your own lunch by butchering wild game with flint tools and cook them over the fire. • Foraging and survival tips. These courses are very much guest lead regarding the content, so if there's something that particularly interests you, then mention it to your instructor and they'll try to fit it in. Will Lord who recently assisted 'Walking The Amazon's" - Ed Stafford - to prepare for his new TV series called 'Naked & Marooned' will personally take this course. So a whole day away from their PC, PS3, XBOX and phones to ensure you have a time to remember. We recommend early booking for this popular workshop. This course costs £50 for a child accompanied by an adult. Add a second child 1/2 price. Lunch and drinks are included. 3 Days of Ancient Brain Tanning / Workshop Experience. Held on the Neolithic flint mines at Grimes Graves in the heart of rural Breakland, Attendees will be invited to stay on site for the duration of their experience. Understanding the hide and its layers. The History we know about tanning explained. Beginning the tasks with the hide you have been given, this involves fleshing and graining to prepare the hide for bucking and rinsing. You will be guided through each step of the process so you come away understanding how to measure your progress. Softening the hide through methods such as removing additional membrane and stretching hide during the drying process, this involves teaching you how to remove moisture efficiently through wringing the hide and mapping your way over the hide so you attend to the right place when it needs attending to. During the day you will be introduced to concepts such as hide glue and the rawhide that the hide is naturally trying to become with out your efforts being applied. Revisit any areas that haven’t completely softened. Introducing and using methods of smoking the hide, how to choose the correct woods and maintain the temperature required so hide stays soft and gains an even colour. Dealing with repairs required from processing such as holes that may have been created during the process and thoughts of how to appropriate the bucks into clothing and bags etc. The course will run from 9.30am – 4.00pm each day. The course is self catered so please bring along your own meals and camping equipment. Please be aware that a reasonable level of fitness is required to achieve the tasks set out in this course. Come and join us on a magical experience to recreate, an ancient goddess from Grimes Graves left by the ancient flint miners 4000 years age. During the course, you will visit where this ancient goddess was left and experience the site in a way that is unique to this special experience. While you are producing your Goddess we will teach you how to get the best results from the flint tools and help you to carve her into form. Along side of the carving and the experience, we will explore why ancient people carved godesses and what these facinating artefacts really meant. The Miners who dug the flint at Grimes Graves, left evidence of ritual and spiritual practices, the mindset of their behaviour is something that this course covers and will undoubtedly become a footprint in your own heart and a memory that your own personal goddess will represent to you.